One of the most beautiful festivals taking place in Japan, the Awa Odori Dance is, in my opinion, one of the must see Japanese summer events. 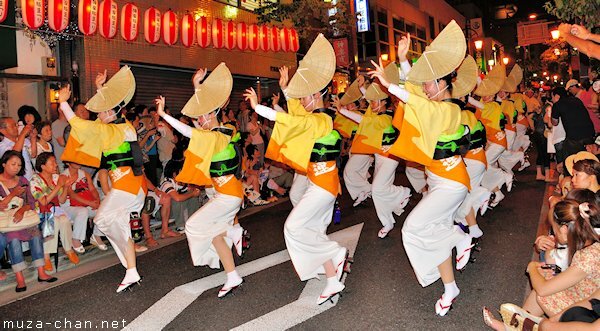 The festival originated 400 years ago in Tokushima, on the Shikoku Island, when the townsmen danced enthusiastically to celebrate the inauguration of the local castle. They enjoyed the celebration so much, that the next year they did it again… and the next year again. Thus, it became a local tradition and since then the festival was never interrupted. Moving to Kanto, a group of people from Tokushima brought the tradition to Tokyo and in 1956 the festival spread, taking place first in Koenji and 15 years later in Kagurazaka. The number of dancers is smaller than in Tokushima, but the dance is the same and the atmosphere is great.